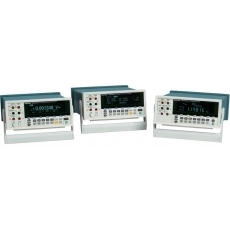 With a Tektronix digital multimeter you can make voltage, current, resistance, frequency, period, capacitance and temperature measurements with confidence. You can also monitor and record measurements over time or environmental ranges and view statistical values to see how your circuit's performance is changing. And, dedicated front-panel buttons provide fast access to frequently used functions and parameters, reducing set up time. Each Tektronix digital multimeter provides the feature-rich tools and precision you need for your most demanding measurements.